The 3 Panel Menu Stand is made from A4 sized sheets that are pre-scored - just print your menu, advertising material etc. fold and glue/tape the small flap and you have a ready made 3D table top display stand. We even use them sideways for Point of Sale displays in our showroom. 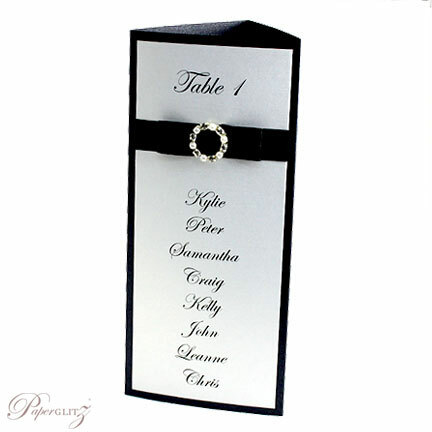 They are popular for wedding table name listings, menus, beverage lists, restaurant specials, promotions and general point of sale. This 3 Panel Menu Stand is made from our gorgeous double sided off white / soft ivory / eggshell coloured lovely thick 250gsm (feels like 350gsm) card that contains 15% pure cotton & 20% recycled content! 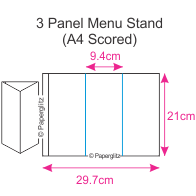 This 3 Panel Menu Stand arrives flat packed & unfolded making them easier to print. When folded they measure 9.4cm x 21cm and are commonly used in both portrait and landscaped formats. This 3 Panel Menu Stand is made from paper that is manufactured in Italy and is converted and packaged by Paperglitz in Sydney, Australia. Made from a premium range of soft to touch cotton blended papers that is popular for both letterpress printers and wedding stationers. Buy with confidence and specify only "Genuine Paperglitz 3 Panel Menu Stands" for your next project.